A VERTICAL CHALLENGE AWAITS YOU! all climbers under 18 years must have a waiver form filled out by their parents. grandparents are not permitted to fill out waiver forms for their grandchildren. The Rock and Rope Climbing Centre is an indoor rock climbing facility located in the heart of Peterborough. 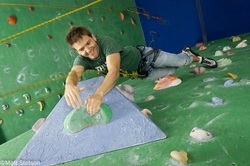 We offer high quality climbing with a full range of difficulty levels for all abilities. Our routes and boulder problems will surely challenge you, whether you're a first timer or a seasoned rock veteran. To get you geared up, our retail shop has a great selection of the top climbing brands. If you're looking to climb on real rock, we also offer guiding services to ensure the highest level of safety and instruction when taking things outdoors. Rock Climbing is a unique sport because it combines a fun physical workout with the mental challenge of problem solving to make it to the top. It's a great way to conquer fears and build confidence with tangible measures of improvement and progression. If you're in search of a new challenge, there's no limit to how far you can go. Climbing is a social activity, with a friendly and encouraging community. Come by and our experienced staff will get you started on the right foot. Challenge yourself, make friends and let's climb! IMPORTANT: Every new visitor is required to sign a waiver form to participate in climbing or belaying. Save time, fill out the form online and we will have it waiting in our system when you arrive. Participants under 18 are legally required to have a parent sign the waiver, without exceptions. Please note that grandparents are not permitted to fill out waiver forms for their grandchildren. Unit 16, 280 Perry St.